SKU: PD-LGROSE. Categories: Pendants, Wondrous Items. 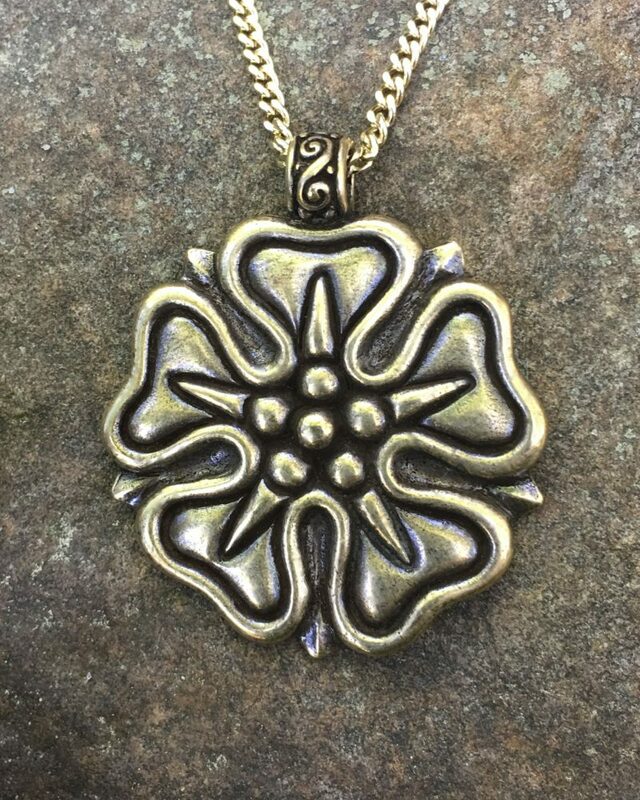 Our Large Rose Pendant is available in bronze or sterling silver and is 2” (50 mm) in diameter. We offer a matching Rose Pin. We also offer a Rose Charm and Rose Earrings. The rose has long symbolized love and beauty. In pre-Christian Rome the rose symbolized devotion the goddess Venus. Later, with the coming of Christianity, the rose came to represent the Virgin Mary. One of the most iconic of historical roses was the Tudor Rose, the badge Henry VII adopted after the end of the War of the Roses, combining the red rose of the House of Lancaster with the white rose of the House of York. Our Rose Pendant was inspired by the Turod Rose.